If you are interested in purchasing any of the available artwork, a signed limited edition giclée print, or commission something similar, please feel free to contact me. Please note that indicative prices do not include postage and handling. 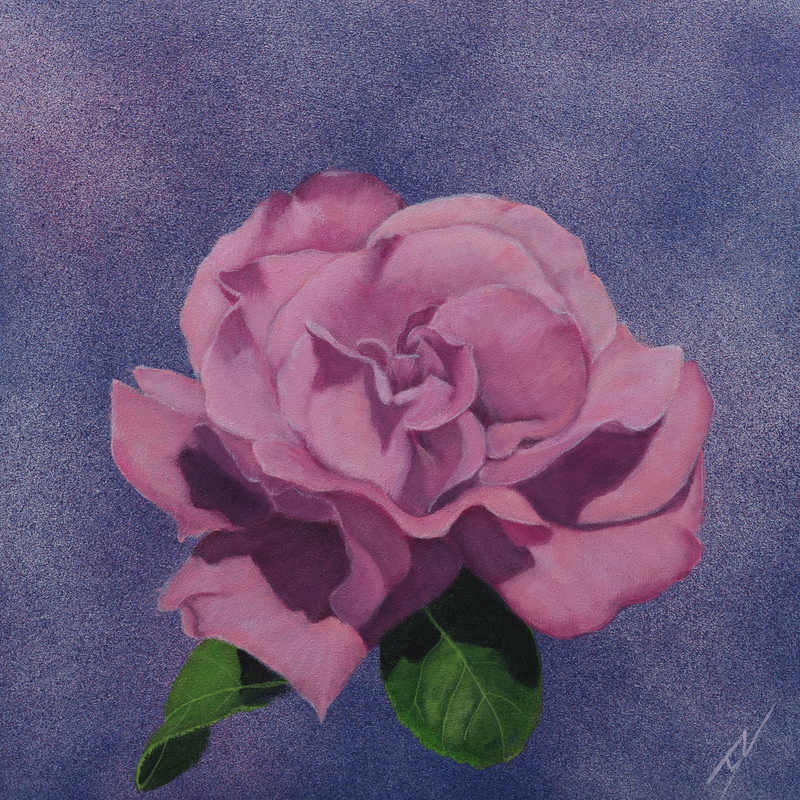 I am also selling original paintings and Wildlife Portraits through BlueThumb. BlueThumb is an online gallery which represents Australian Artists, plus they arrange secure payments and shipping. Prices will vary from the ones shown here, as they include commission as well as shipping and handling charges. “Strelizia Paradise”: Mixed Media on deep-edge canvas; Unframed; 5ft x 2ft. Acrylic, ink, paper and modelling paste. NFS. 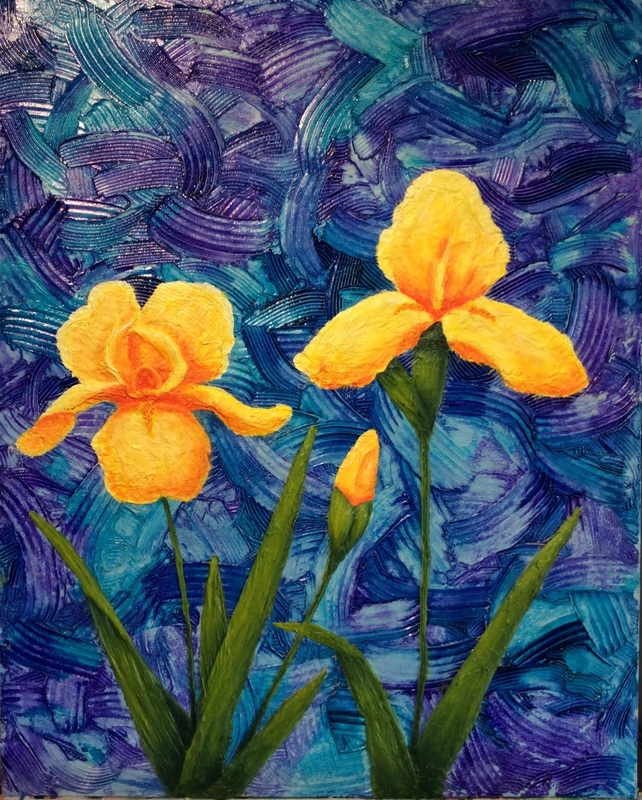 “Yellow Irises”: Mixed Media on board, framed: acrylic, ink, modelling paste and paper. (SOLD). 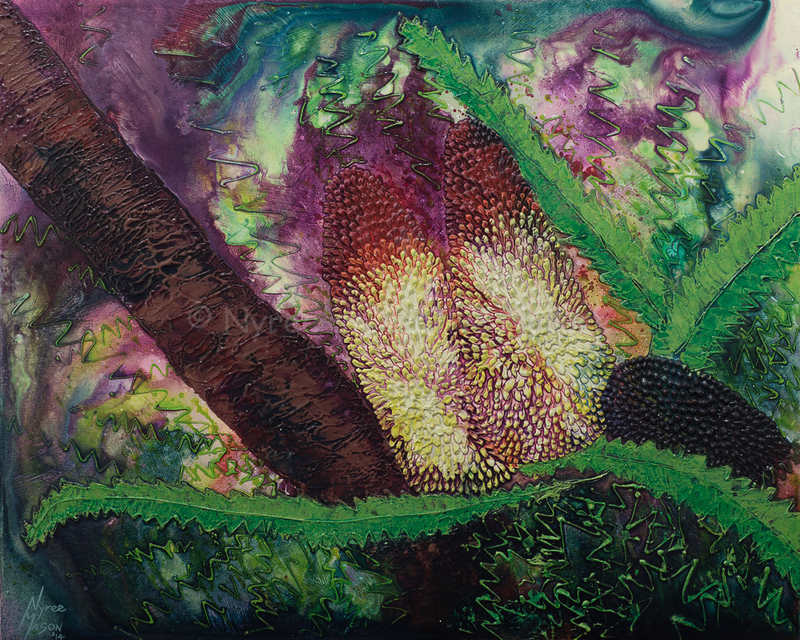 “Banksia Glow”: Mixed Media on wrapped thin-edge canvas; Acrylic, ink and modelling paste. ($300). 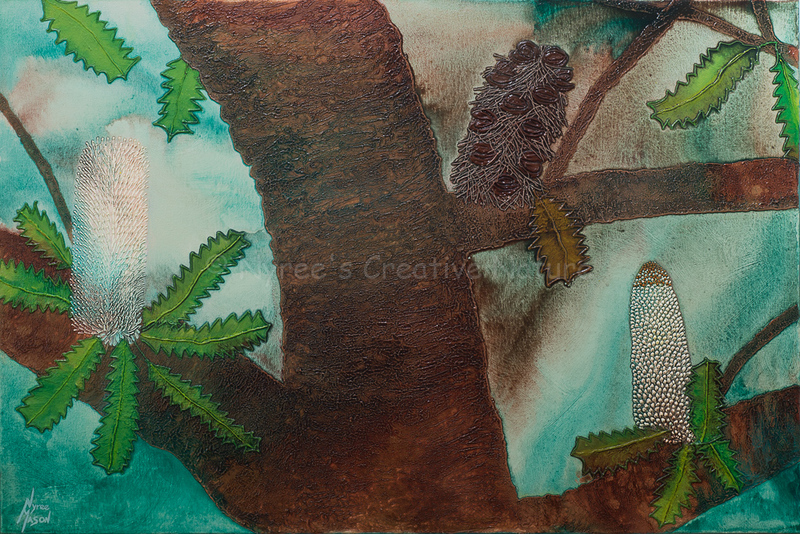 Banksia Serrata: Mixed media on wrapped deep-edge canvas; 91cm x 61cm; Acrylic, ink and modelling paste. ($300). 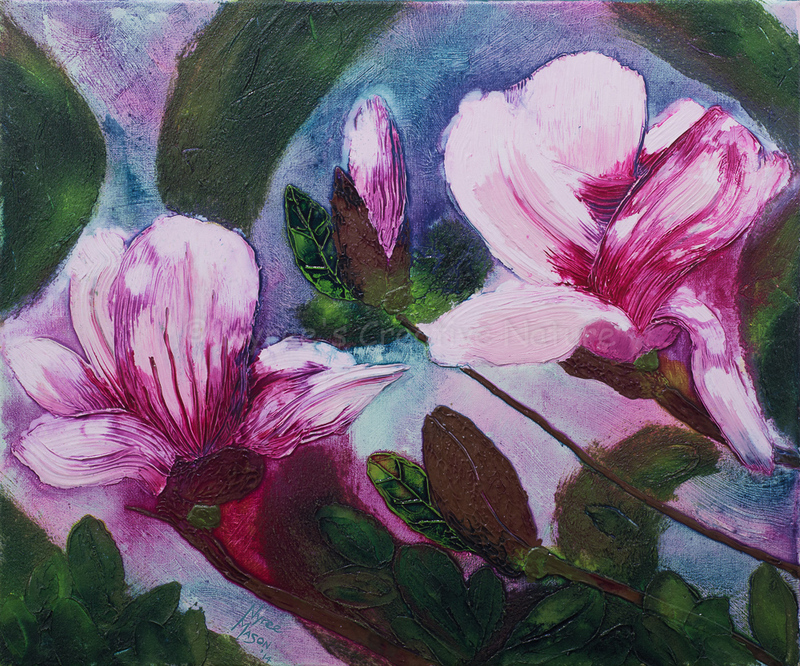 “Melting Magnolias”: Mixed media on wrapped thin-edge canvas; 51x61cm; Acrylic, ink, modelling paste and blended fibers. (SOLD). 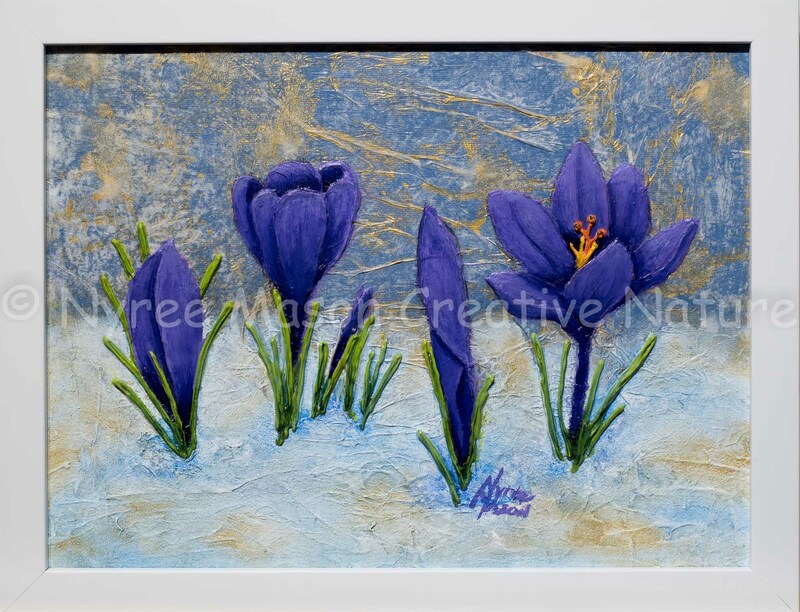 “Crocuses in the Snow”: Mixed Media on canvas board; Framed; Acrylic, ink, paper, modelling paste and beads. (SOLD). 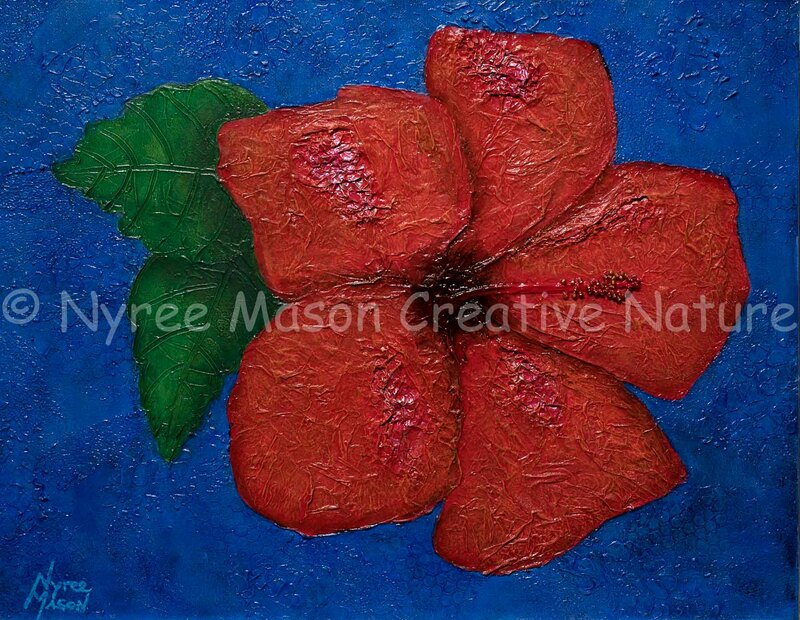 “Hibiscus Bling”: Mixed Media on wrapped thin-edge canvas; 46cm x 35.5cm; Acrylic, ink, paper, foil, beads and modelling paste. ($40). 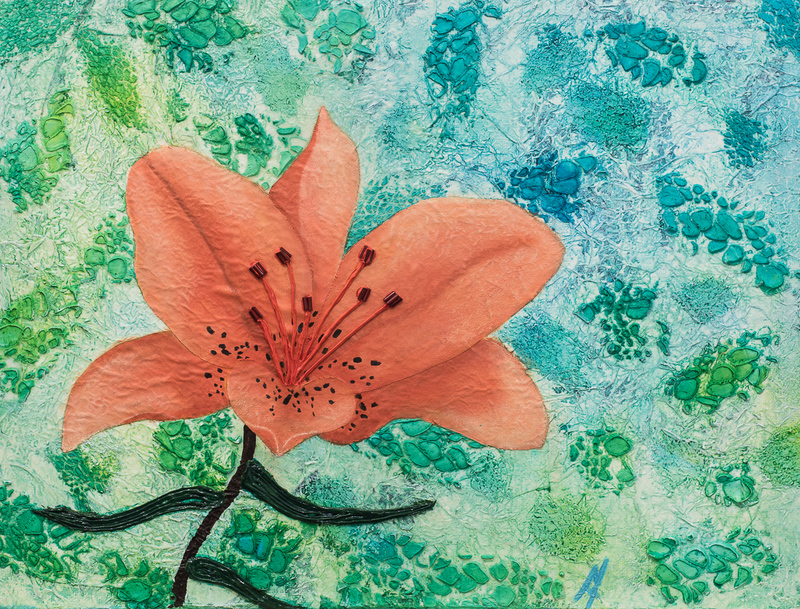 “Lilly Bling”: Mixed Media on thin-edge wrapped canvas. (SOLD). 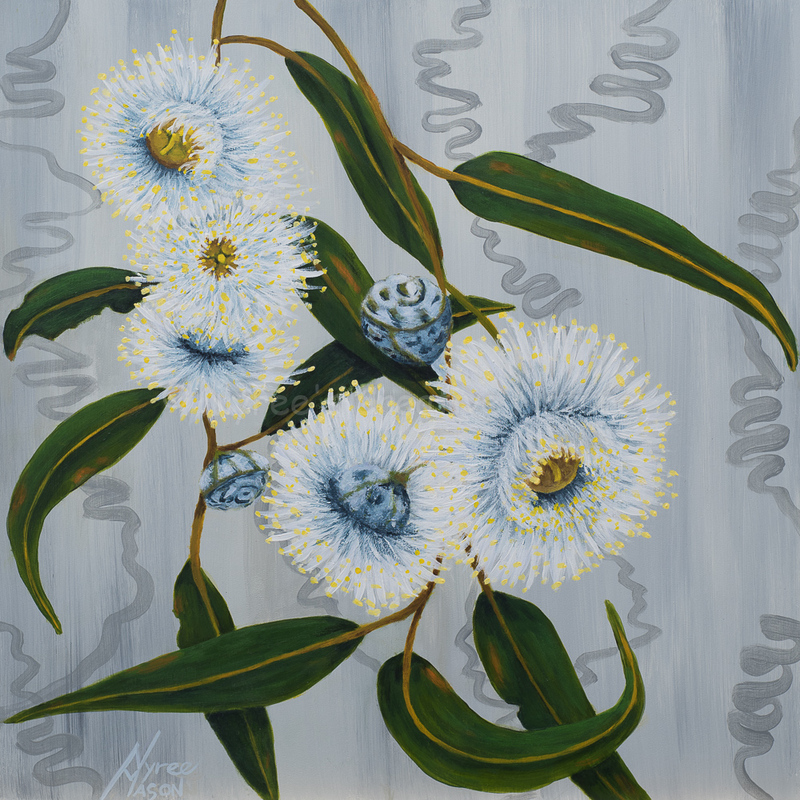 Eucalyptus Macrocarpa: Acrylic on wrapped thin-edge canvas. (NFS). 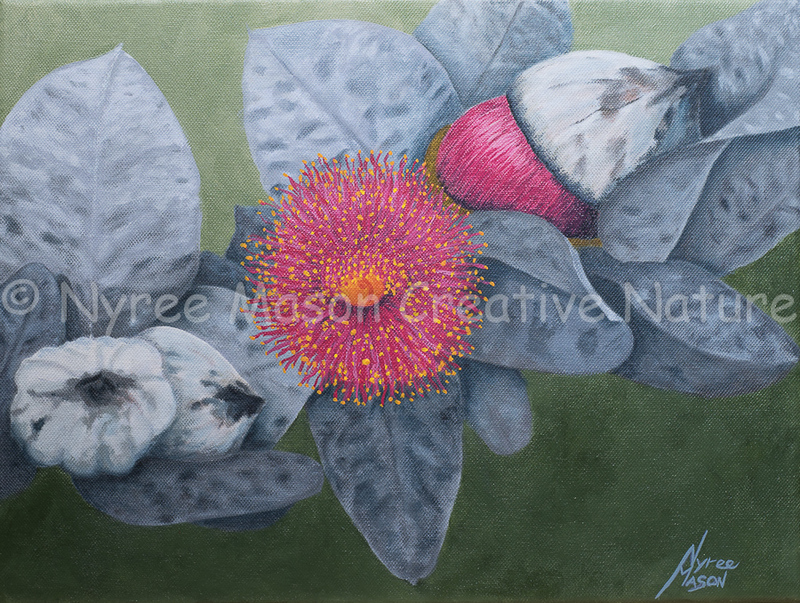 Blue Gum Blossoms: Acrylic on deep-edge board; 30.5cm x 30.5cm. (SOLD). 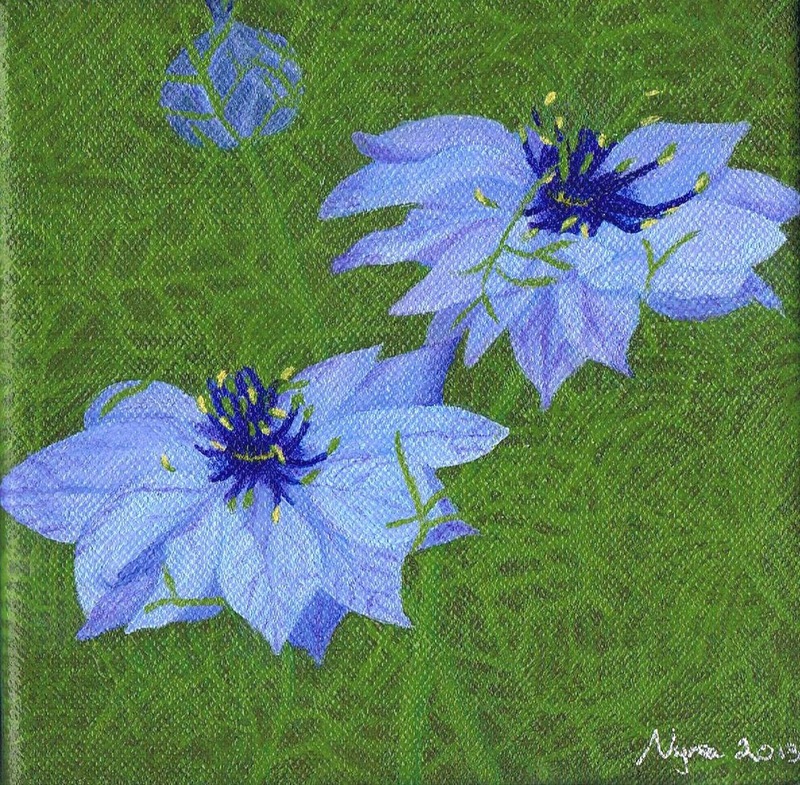 “Love in the Mist”: Acrylic on thin-edge wrapped canvas. 15cm x 15cm. ($40). “Floating Rose”: Acrylic and Acrylic Spray Paint on Board. ($100). 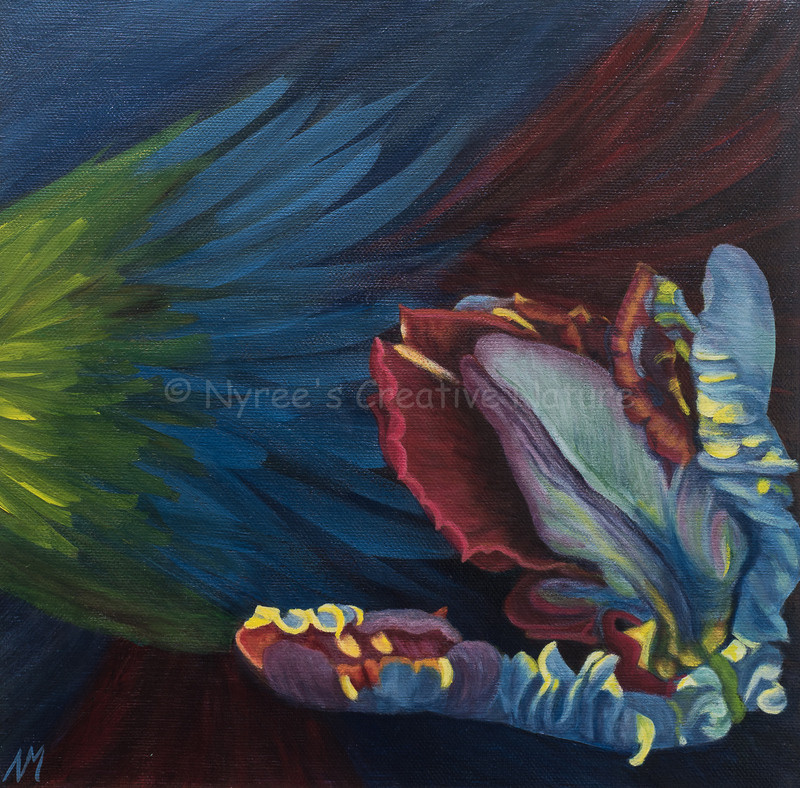 “Audrey II” (Parrot Tulip): Acrylic on thin-edge wrapped canvas; 30cm x 30cm. ($60). 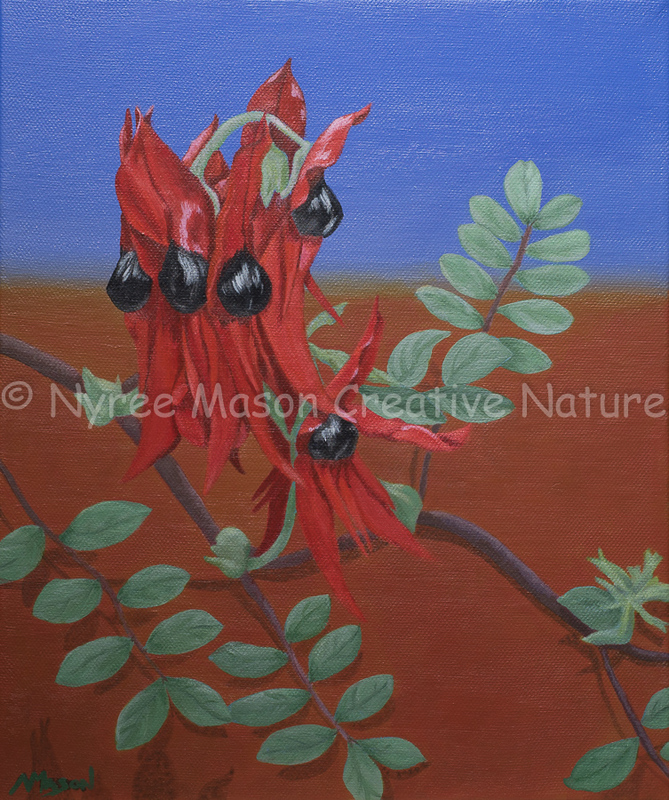 Sturt’s Desert Pea: Acrylic on wrapped thin-edge canvas; 25.5cm x 30cm. (SOLD).